A graduate of West Virginia University in Morgantown West Virginia, Dr. Heastie holds the doctorate degree in Educational Psychology. In 1986, shortly after receiving his bachelor’s degree in Biblical Studies from Freed-Hardeman University in Henderson Tennessee, the Nassau Bahamas native returned to the Bahamas and became a secondary school teacher in the public school system with the Ministry of Education. As a high school teacher, Dr. Heastie subscribed to, and espoused, a philosophy that every student can learn and that given the tools for effective learning every student can perform well. Consequently, he worked with students individually and collectively to empower them with scientific tools to improve memory, and trained them how to become more organized and better managers of their time and themselves. Concurrently, Dr. Heastie worked with students’ families, teaching them how to build and increase students’ confidence in their ability to perform at their optimum academic potential. Dr. Heastie’s desire to improve his own skills motivated him to return to the United States in 1989. In the spring of 1993 he graduated from LaSalle University in Philadelphia Pennsylvania with a master’s degree in Psychology. After receiving his master’s degree he worked as a Behavior Specialist with at-risk students in the Philadelphia School District. His innovative work of modifying students’ behavior by showing them how to improve academic achievement was the genesis of “Successful Start, Successful Finish” – a 1-day workshop that teaches students how to master their memory, their study skills, and the test-taking skills. Following the completion of his doctorate degree in 2001, Dr. Heastie worked as Special Assistant to the President, for Diversity, at Grove City College in Grove City Pennsylvania and later took a teaching position in the Department of Educational Leadership at Fayetteville State University, Fayetteville North Carolina. Today, Dr. Heastie is Professor of Psychology at Miami-Dade College in Miami Florida, where his primary responsibility is preparing college students for advanced degrees and the world of work. Many of Dr. Heastie’s students are first-generation college students, which he understands well given that he himself is one. Dr. Heastie is also president and CEO of Heastie Consulting International – a company whose primary focus is training. 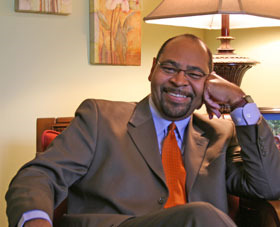 As lead consultant of the company, Dr. Heastie draws on his academic training and his experiences to design, develop, and conduct training programs in customer service, management, and education for businesses, schools, community organizations, and churches. Because of his ability to speak to numerous issues and his ability to motivate people he, is often invited by companies and organizations to give keynote and motivational speeches on a wide variety of topics. Dr. Heastie formerly produced and hosted a television and a radio program – The Family Enrichment Hour, a weekly television program, and The Family Enrichment Minute, a daily radio program. Both programs endeavored to add value to family life. Subsequent to producing the programs, Dr. Heastie authored a book on family, Peanut Butter, Jelly, & Us: Practical Faith-based Principles for Strengthening Families. For the past thirty years, Dr. Heastie has been happily married to his high school sweetheart, Gaynell; they have two beautiful adult daughters – Samantha and Ashley.